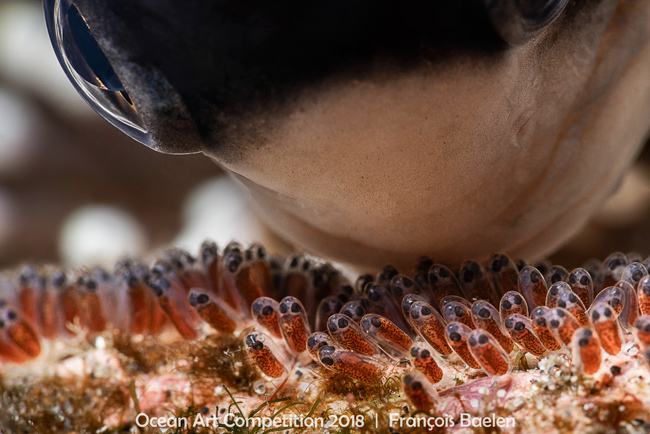 The Story: When it comes to clownfishes, we can safely say that Daddy does everything he can to make sure the next generation is safe. He takes care of the eggs by making them breathe with his fins; he removes dust, debris and dead eggs from the nest. This was a really lucky shot as I was trying a new wetlens (+20 diopter). It is pretty hard to use because its depth of field is so shallow that I had to focus manually. What a surprise it was to get this lovely behavior and the clownfish eye in perfect focus! Equipment Used: Sony A7III, Nauticam NA-A7III Housing, Sony FE 90mm Lens, Moby Noodilab Diopter, Inon Z-330 Strobe.